So I was busy homebrewing on my NDS, even bought myself a DSerial board to use it as an ultraportable serial/debug console. I had a few ideas for the much faster, native parallel interface too, so when we were sending out boards at work, I threw my own “DParallel” onto the layout. The boards came back, and we had to cut them apart…note to self: DO NOT let your machinist saw apart your boards on a huge gritty band saw. As is semi-common practice (and just like on the DSerial) I laid out a big VDD (main system power) plane on the bottom of the board and a big GND plane on top. Before inserting the board, I peered down the sides of the card slot to be sure they weren’t metal that would short against the sides of the board, and even performed some quick “due diligence” checks with an ohmmeter to be sure I didn’t do anything stupid (such as somehow shorting VDD and GND together) that would result in frying my DS. Turns out that the top and sides of the card slot are plastic, but the back surface (hard to see in an all-black DS) is METAL, and it’s connected directly to ground. Combine this with a big VDD plane in direct contact with it, and some rough board-sawing leaving some exposed copper on said plane, and a heap o’ trouble ensues. Anyway, due to some smart engineering by the big N, I am spared from my own stupidity (it just blew an internal fuse). Googling for Nintendo DS power consumption specs to figure out what replacement fuse I needed, I saw just forum posts with educated guesses ranging from ~ 300mA to upwards of 1.5A. So while I had it under the knife, I decided I’d settle the question once and for all. 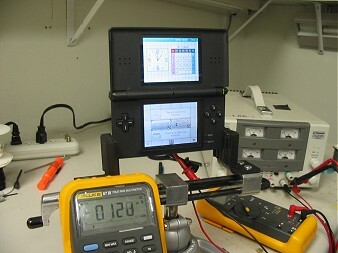 All measurements taken on a DS Lite “revision as of Jan. 07” at 3.70VDC, the nominal voltage of the battery pack. All the following measurements taken at Brightness level 3 (default) unless otherwise noted. SuperCard SD: add 31-37mA while idle…a bit more while reading/writing the SD. 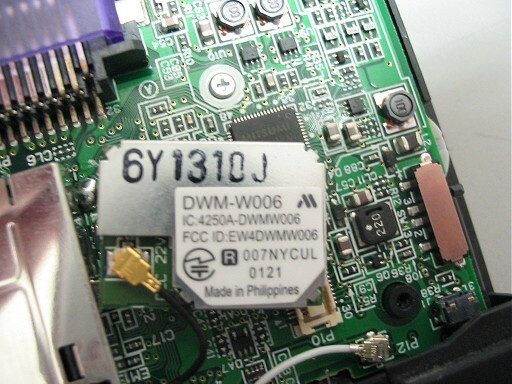 WiFi enabled (“new” 1/2007 DS Lite wifi chipset) : add 49 ~ 63mA, varies based on what it’s doing. Around the tail end of 2006, Nintendo switched to a different WiFi chipset (sorry, can’t find any more info online from DS forums, etc…only the code changes in libdswifi CVS to accommodate it). This is the one I have. Power draw results for the previous chipset could vary from this. Numbers obtained by dividing battery capacity (1000 mAh) by actual current consumption. The “mAh” (milliamp-hour) rating means the battery can in theory supply 1,000mA for 1 hour (or 100mA for 10 hours, etc.). These are rough ballparks that assume 100% conversion efficiency, extracting 100% of the power out of the battery, and all kinds of other things which do not reflect reality. Your real numbers will be lower. As you can see, backlight setting has a large impact on total run time! Fuse sizing (for everyone else who did something dumb and blew F2): I had some 500mA 0603 surface mount fuses laying around (Rezu project represent! ), so I used one of these. I think it’s a good number given the above. Worst-case power usage I could produce was just a hair under 300mA, but some other DS slot 1/2 cards (games, flashcarts, rumble paks, specialty cards like the Opera Browser cart with onboard RAM) may draw more juice (still, I doubt it would bring the total over 500mA). Even if you’re sticking your own Pentium 4 accelerator card in there, I wouldn’t advise sizing the fuse above about 750mA, absolute max. It’s there in part to keep the Li-Ion battery pack from going all Sony Vaio on you and melting your pocket into hot slag if something in the DS shorts. Mitsumi’s web site provides no evidence that this module actually exists, of course. This entry was posted on Saturday, March 31st, 2007 at 10:27 pm	and is filed under gEEk. You can follow any responses to this entry through the RSS 2.0 feed. You can leave a response, or trackback from your own site. Interesting. I didn’t know the backlights were THAT power hungry. If you ever have it open again, I’d be curious to see exactly how much power official games take in “sleep mode” (lid closed). Also the difference between repeatedly calling swiWaitForVBlank, versus spinning in a cache/ITCM loop, versus spinning in an un-cached main RAM loop. I was wondering what the numbahs on the wifi antenna would be. It would be a cool hack to mod it, maybe increase the range? I think an external antenna could be made, if the specifics were known. Someone with more know-how can point me in the right direction? Got a few questions. Fuses 1 and 2. Which one corresponds to the DS card slot and which one for GBA slot?? I’m not the “tech-type”, but what is the lowest amperage for the fuse I should use? The highest you said should be 750mA. Finally are the fuses time-lag, or fast-acting? Thanks in advance. Oh yeah, one more thing. I don’t know how to solder surface mount fuses. Could I use non-surface mount fuses with the correct amp specifications? @Anakaris: I don’t think the fuses F1 and F2 correspond directly to a particular slot. It looks like F1 is in series between the wall charger and the charging circuitry / battery (protects the battery and wall charger if a battery cell becomes shorted), and F2 is in series between the battery and the main DS electronics (protects the battery and motherboard from shorted cartridges, like the dumb thing I did). The fuse should be a fast-acting type, 500mA should be plenty. A non surface mount fuse of the correct ratings will in theory work, but it doesn’t much change the problem – you still have to attach wires to the tiny SMD pads, but now you also have to find a way to mount and insulate your wired-in fuse inside the DS so it can’t rattle around or short against other things. I highly recommend using the correct surface mount fuse (0603 size) if you can. To get the old fuse off, carefully add solder to the pad on each side until there is enough to touch the iron tip to the solder balls on both sides at the same time (hold the tip against the side of the fuse) so that they melt, and nudge the part off the pads – once free of the pads, it should stay stuck to the tip and you can pull it right up. (See the 2nd and 3rd image of this tutorial.) Using solder wick or just a clean tip, remove as much solder from one pad as you can, but leave a solder ball on the other pad (add a bit if necessary). Hold the new fuse with tweezers, aligned the same direction as the original was. Melt the solder ball with the iron, and slide the end of the new fuse into the solder ball so that it is centered on the pads (one end should now securely stuck to that pad with the solder ball, and the other end resting snugly on top of the other pad). Finally, add solder to the resting pad so that it also flows against the metal edge of the fuse. Hey, I have a question to ask (if you even see this). Does the voltage on the fuse matter? I’m a complete newb when it comes to electronic engineering. I found this fuse at littelfuse(dot)com (part# 0434.500): Very Fast Acting; Size – 0603; AMP RATING – 0.5000; VOLTAGE RATING – 32; RESISTANCE – 0.1930; I2t – 0.0087; Thin-Film Chip; Surface Mount. Will this work for replacing the f2 fuse in the DS? Most of the nds “scenes” are dead or dying (the ones I know of anyhow). Thanks in advance. Just a quick question. bought my younger kid a Ds for Xmas, on january 1st while playing a game the thing shutdown never to turn on again. Took it to the Nintendo service center, had to leave it for a diagnostic. They called me one day after, two let me know it was repaired and ready to pick up. When I asked the tech, he told me that it was ormal for a new Ds to blew a fuse due to the new battery producing more current than normal. I am not an electronics tech, but that sounds like BS! can I have your opinion please, I am wondering if I should ask for a replacement. I was replacing broken covers (hinges) for both of my son’s games. The upper display on one of the games didn’t work and I figured I could troubleshoot the problem when I took both of the games apart by using the working upper display and ribbon cable with the unit that didn’t work to make sure the problem was with the upper display or cable, then I could substitute the cables to see whether it was the cable or display. Somehow I managed to blow the fuses in both units. I figure that somehow the lower display case must have contacted the back of the PCB, but I thought I was being careful enough as it was made clear with the instructions I had for replacing the case that it was important to make sure this didn’t occur. On one of the surface mount fuses it is labeled “32”, I am not sure if that is short for 300mA or 320mA. I wouldn’t think it would be the voltage ratng as it the current should be the most important spec. @Fernando: There’s probably no danger (in terms of breakability, etc.) keeping the repaired DS with its new correctly sized fuses, but I’m inclined to call BS on the explanation that the fuse blew due to a “higher current” battery. A typical Li-Ion or Li-Pol battery as in the DS (old or new) can produce several amps without breaking a sweat; what limits it is how much the electronics actually are drawing at any given time. My guess at the fuse rating is 500mA. It’s more likely they reduced the value of the fuse in newer DSes and shouldn’t have; or that a newer part (e.g. Wifi module revision) draws bigger power bursts than in previous generations, but that’s a mouthful for a minimum-wage tech to explain. @David: Unfortunately “32V” is also a common voltage rating for SMD fuses, complicating what a vague unitless “32” on top of the fuse might mean. Just a quick one, I had 3 old style DS,s today now I have one that works oops. The penny is just dropping as to why the other two are not working since I changed the screen,s and cases, thought I was doing well as well, who would have thought that that little bit of foam was so crucial. The thing is I keep seeing info on the DS light but where are the fuses on the old type. can you help in some way. thanks for your time. Tim the info iv got from this site is ace, loads of thanks for what you have done. Sorry this sorted it for me. Good work any ways. Hi tim,first of all,i found this website by accident,im thankful i did…i have two ds.fat ds and ds lite….the lite has the orange lite on..from what ive seen on the wb,it might be the fuse.if you think otherwise,please let me know….also, the fat ds had a cracked top screen,wich i replaced….and i ran into the prblems of not working at all,as ive seen on other posts that people have that rouble because of the ribbon not being possitioned right…i fixed that….well the problem with the fat one now is that the top screen still doesnt work….is just blank.im wondering if is a faulty scren or the ribbon from top to bottom….if you have any pointers,plase help..once again,thanks for this site and your time,ive learned a couple of things….thanks, yogiboy MN>>. hi, tim. i was waiting for a response from you….anyway…i can figure the orange light with the help youve provided already…my other problem is the old fat ds i mentioned above….i replaced with another screen,it comes up blank (white screen). but i noticed tonight that the bottom screen shows the top clock as well as what is supposed to on the bottom. you can barely see the clock on the bottom but i still think is odd.im wondering if is the top to bottom ribbon,or i just plugged it wrong.i keep messing with it,but it still wont show or it wont turn on…i really need someones help….please.. thanks again for the site. My DS Phat had just stopped turning on and charging, so I found a website (http://www.m3wiki.com/index.php/Nintendo_DS_Lite_:_Repair_a_broken_console_(blown_fuse)) and bridged the F1 fuse on the back and now it charges fine (orange light comes on) but won’t turn on. Do you think I need to bridge or replace the F1 and F2 fuses to get it working again? Hey, i have a problem with my own nds which i have no idea what it is, it starts and it loads just fine, but when i play certain games like New super mario bros is just shuts down by itself for some reason, and always when i use the buttons frequently. to get the Nds going again but when i started to play on it it kept shutting down and i have no idea what causes it. However, games like Final Fantasy tactics 2 works for hours without any problems. I would like to ask if there’s a nearest service center here in Bulacan. My son DS Nintendo 2006 model I want to bring for repair. And where I can buy cheaper Memory Stick and Memory Card. ThankS! Hi, this might be completely unrelated, but probably isn’t. My DS original’s speakers stopped working, so I took apart the top section of the case and cleaned off the contacts on the speaker. Only one thing, I forgot to take the battery out before I disconnected the main ribbon cable! After that, my DS wouldn’t turn on and only made a clicking noise while the light flashed on then off. What’s especially weird, however, is that when I disconnected the ribbon cable with the battery still in, then took out the battery, then reconnected the cable, then put the battery back in, it worked and still is working perfectly! Can you explain why this worked? I personally have no clue and was just trying anything and everything. last post should be user ID ynysmon2007 !!!!!!!! As long as you can test that your fuse is really blown you could just solder the new fuse on top of the old one using the same contacts so that you dont damage the motherboard contacts or other components around it. Very fine self closing tweezers also help alot. 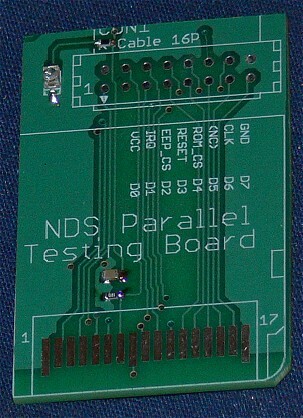 Also trying to design a manualy or self reseting fuse, but not just for the NDS, anyone know of one this size that already exists? @PC Doctor: Self-resetting fuses do exist, search for “PTC fuse” “polyfuse” (on digikey, etc.) to turn up the relevant parts. The difficulty with them is that they add some resistance (sometimes 100s of ohms) in their “unblown” state, and still conduct slightly in their “blown” state. When they are designed into a commercial gadget, the part has been carefully chosen so that the on-resistance does not create its own problems such as excessive voltage drop under heavy load (e.g. in the DS’ case, false “low battery” shutdown if the backlights are turned all the way up), and e.g. the off-state leakage does not destroy the battery from overdischarge if the battery is not pulled within a couple days of the “blown” fuse. The upside is that they remain “blown” for as long as the device is powered and the fault exists, and automagically reset when left unpowered for a short length of time (normally a few minutes). j’en ai conclut que la ds lite possédait des fusibles 1 Ampère. Hi, a F2 labeled “32” fuse just blew yesterday. While I was trying to turn my ds on, it just wouldn´t. Then started googling about it. 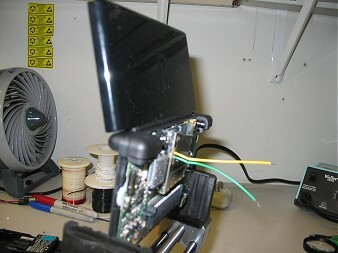 If you ever can´t find a relatively compatible fuse for DS, try bridging both contacts using a small cable and a soldering gun. It took a few hours of a -looking good- job. when I on my nintendo ds the power light is on but the screens won’t turn on. Thanks for the data. It was really useful for my project!